Audrey Whitman's dreams are coming true. Now that their five kids are grown, she and her husband Grant are turning their beloved family home into a cozy bed and breakfast, just a mile outside of Langhorne, Missouri. Opening weekend makes Audrey anxious, with family and friends coming from all over to help celebrate the occasion. But when Audrey's daughter, Landyn, arrives, the U-Haul she's pulling makes it clear she's not just here for a few days. Audrey immediately has questions. What happened in New York that sent Landyn running home? Where was Landyn's husband, Chase? And what else was her daughter not telling her? One thing was for sure, the Chicory Inn was off to a rocky start. 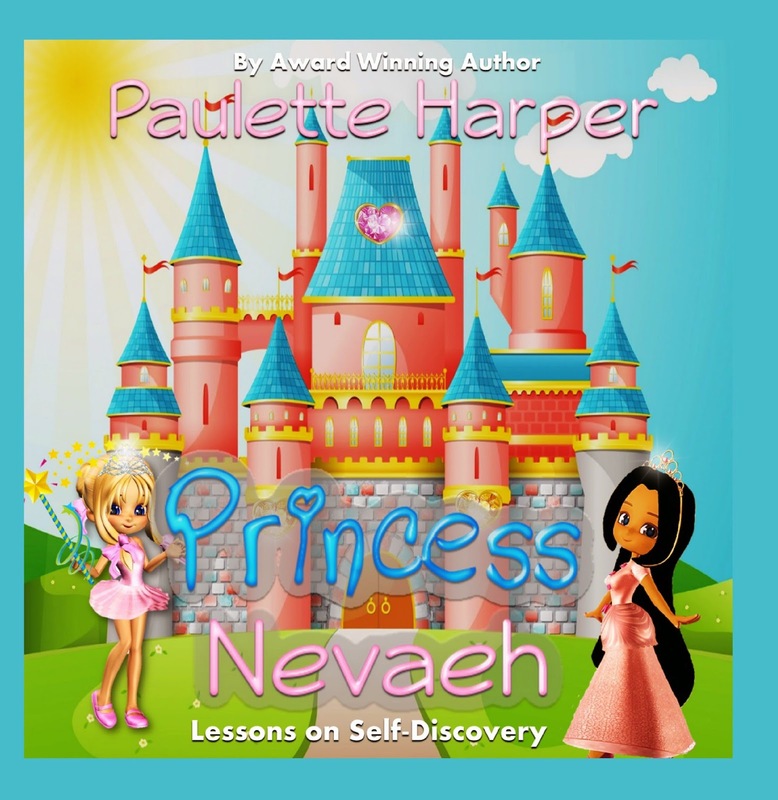 Can Audrey still realize her dream and at the same time provide the comfort of home her daughter so desperately needs? 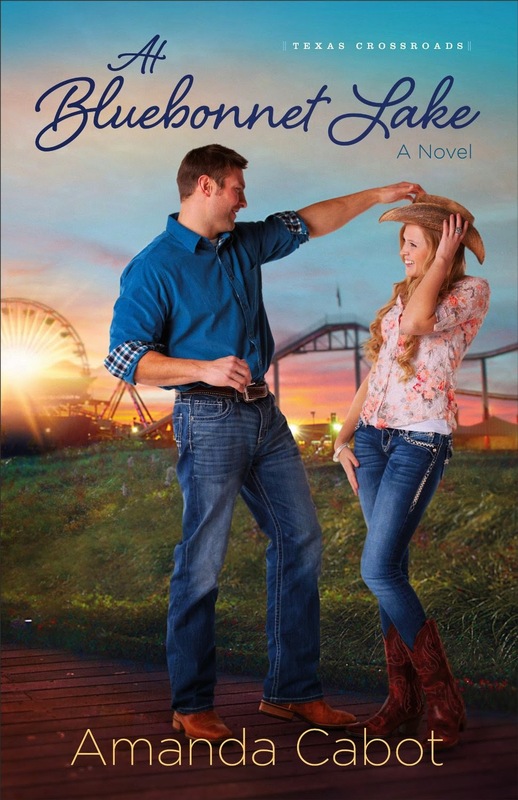 HOME TO CHICORY LANE is really the story of Landyn and her husband Chase. Chase is chasing his dreams but jumping without talking to his wife, just presenting her with fait accompli. And, of course, Landyn is rebelling, not wanting anything to do with his plans. To make matters worse, things are going from bad to worse, quickly. HOME TO CHICORY LANE is a compelling story that will draw you in and make you care about the characters even when you want to throttle them and sit them both down and have a serious talk. Not that they’d listen. Both Chase and Landyn are hardheaded and selfish and need to grow up—for more reason that one. 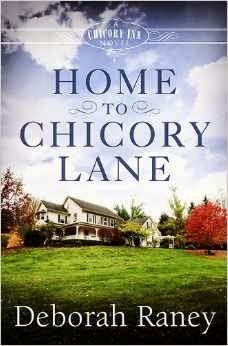 Don’t miss HOME TO CHICORY LANE for a compelling read that will make you thankful for home and family. $14.99. 352 pages. 5 stars. 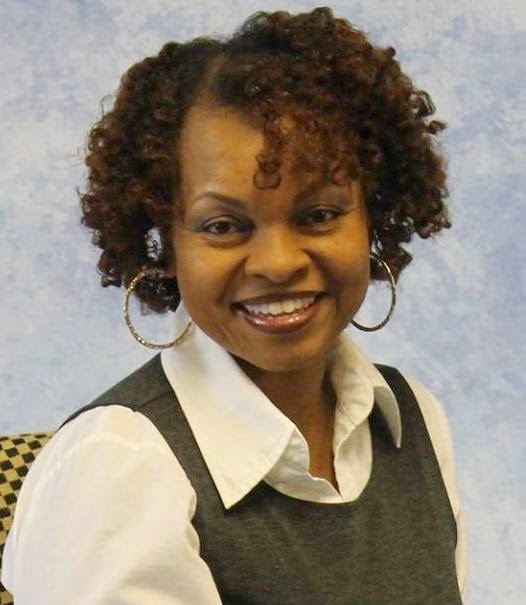 About the author: Deborah Raney's books have won numerous awards, including the RITA, National Readers Choice Award, HOLT Medallion, and the Carol Award, and have twice been Christy Award finalists. She and her husband, Ken, recently traded small-town life in Kansas---the setting of many of Deborah's novels---for life in the (relatively) big city of Wichita, where they enjoy gardening, antiquing, movies, and traveling to visit four children and a growing brood of grandchildren who all live much too far away. Are there experiences you’d rather toss in the dumpster? 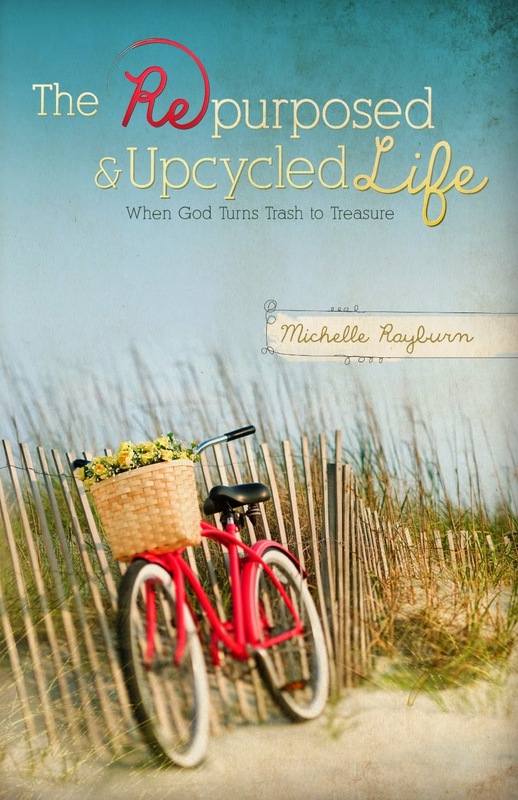 THE REPURPOSED & UPCYCLED LIFE is humorous and well-written. Very engaging. It identifies issues that we’ve all struggled with—such as labels that we think describe us. Fat. Ugly. Stupid. Unlovable. Fill in your own adjective. She shows us how to let them go. Don’t try to hide behind your children in the family picture. Everyone who sees the picture will know what you look like anyway. She also shows us not to sweat the small stuff. Let go of the things you regret. They are past. Water under the bridge. Gone. Start thinking positive. Embrace your present. Don’t live in the past or the future. Take the time to enjoy the now. Wise advice administered in a funny way that is sure to bring the point across without beating us over the head or boring us to tears. Recommended. $12.59 paperback. $5.69 Kindle. 159 pages. Tandi Reese and her sister, Gina, have always been bound by complicated ties. Amid the rubble of a difficult childhood lie memories of huddling beneath beds and behind sofas while parental wars raged. Sisterhood was safety . . . once. But now? Faced with legal papers for a fraud she didn't commit, Tandi suspects that her sister has done something unthinkable. With Tandi's wedding just around the corner, a trip to the North Carolina Tidewater for a reckoning with Gina was not part of the plan. But unraveling lies from truth will require confronting strained sibling bonds and uncovering a dark family secret that could free Tandi from her past or stain her future forever. 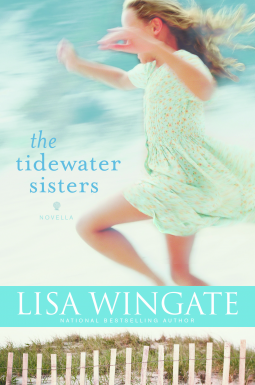 THE TIDEWATER SISTERS is the perfect epilogue to The Prayer Box. I enjoyed finding out what happened after the ending of The Prayer Box, and worried for awhile that Tandi's and Paul's wedding might be derailed. This is a great novella, quick, easy to read, and gripping. I thoroughly enjoyed it. 5 stars. 127 pages. $2.99 Kindle. Are you trying your best to be a “good Christian,” but still feel that something’s missing? Does the “peace that passeth all understanding” seem to be missing in your life? Has your spiritual walk come to a stand-still? Maybe you need a fresh start . . . and a fresh understanding of The Other Comforter that the Lord Jesus promised his disciples he would send. 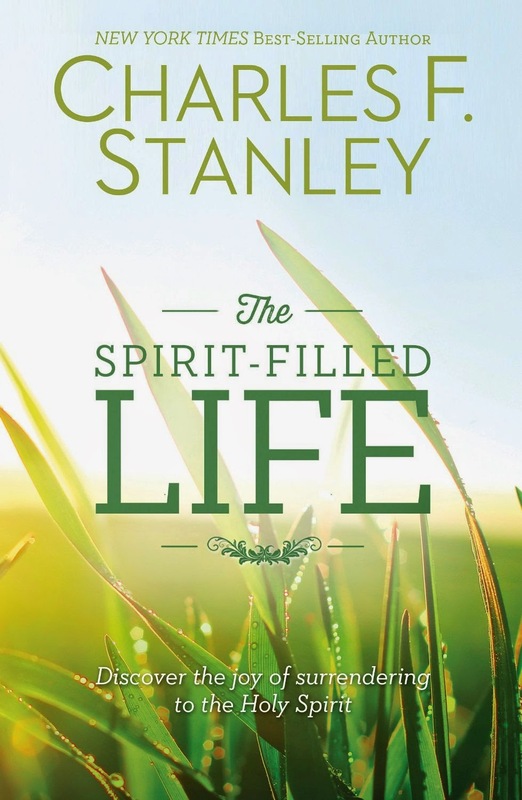 The Spirit-Filled Life by Dr. Charles F. Stanley provides an introduction, and invites you into his study as he patiently peels back the layers of misinformation, misunderstanding, and just plain bad theology that have been foisted upon the third member of the Trinity . . . The Holy Spirit. Be prepared to take some time with this book; it’s not “How To Rock The Holy Spirit In 30 Days.” This is going to be a journey that will transform your understanding of the Holy Spirit . . . and it will transform your life, as well. It’s not easy being Sloane Templeton. 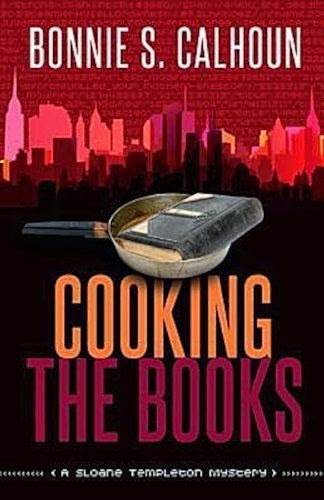 COOKING THE BOOKS is the first book in Ms. Calhoun's Sloan Templeton Mystery series. Ms. Calhoun is the queen of sarcastic, snappy, snarky writing, I think, and some of the wording indicated one thing but was in fact quite another so that made for interesting reading--but it also served to keep the reader distant. The characters were as wacky as promised. Over-the-top so. There were a lot of different subplots so that it got confusing at times and some of them didn't seem to get resolved. The main topic was sometimes graphic at times, but well presented. Readers of cozy mysteries might love COOKING THE BOOKS. A fun, quirky book with promise. $14.99 paperback ($6.00 bargain price). $9.99 Kindle. 320 pages. In Chicago, Dr. Jeremiah Vaughan finds his life suddenly turned upside down when his medical license is stripped away after an affluent patient dies. In a snowball effect, his fiancé breaks their engagement. In an attempt to bury the past, Jeremiah accepts Dr. Hillerman’s invitation to join his growing practice in the isolated Alaska Territory. Gwyn and Jeremiah soon recognize a growing attraction to each other. But when rumors of Jeremiah's past begin to surface, they’ll need more than love to face the threat of an uncertain future. ALL THINGS HIDDEN is a historical suspense by master historical writer Tracie Peterson and suspense writer, Kimberley Woodhouse. I was excited to get this book, and anxious to see what this duo would come up with. Gwyn is hurting by the abandonment of her mother and sister six years prior, and Jeremiah is accused of medical malpractice and told--by his own parents--to get out of town. Rejected by his fiancee, he accepts the offer of his mentor and flees to Alaska to provide medical care for the people relocating there due to the depression. An obvious bad guy, with his own POV, adds mystery and intrigue. I had to keep reading to see how this would all play out. Recommended for readers of historical suspense. One of the best historical suspenses I've read this year. $14.99 paperback. $9.99 Kindle. 352 pages. 5 stars. horses, can bring extra income into the household. But Emma can't do it alone; she enlists the help of the lighthearted Megan. on the prairies of Texas. As the four cousins forge a new family amid the unfamiliar ways of those living on the plains, feel the suffering of loss and the joy of true love found. 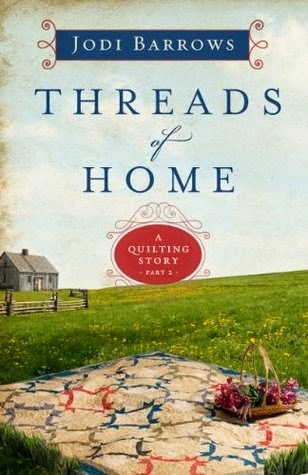 THREADS OF HOME is the second book in A Quilting Story series. Readers will want to read book 1, Threads of Change, as these books do not stand alone. I didn't read the first book in the series, and I was confused about what was going on for awhile. This book has head-hopping issues, where were are in multiple character's heads in the same paragraph. Very distracting. There is also a lot of telling and back story involved. I had a very hard time getting into this book, probably because I hadn't read book 1. If quilting books are something you enjoy (and Jodi Barrows is a published quilting book author) then you might enjoy A Quilting Story series. If you think you might be, start with book 1, Threads of Change, as these books apparently don't stand alone. $7.69 Kindle. $14.99 paperback. 208 pages. Janie Dunn’s dreams of being an opera singer suddenly dim when, at her dying cousin’s request, she flees Boston with her cousin’s newborn son to protect him from his abusive father. She moves to Kansas to live with her brother, who poses as her husband to protect her identity, lest the baby’s father seek her out. But it’s hard living a lie; even more so the closer she grows to her neighbors on the prairie. Aaron Harper lost his wife four years ago in a tragic accident. Without a mother to help raise and educate his two chidren, Aaron sent them to live with his brother and sister-in-law in Windmill, a few hours’ train ride from his family’s homestead, to attend the local school. Yet Aaron regrets seeing his son and daughter so rarely. He yearns to have them under his roof again, but without someone to educate them, it’s an impossible scenario. Life takes a dire turn for Janie when her brother dies. The Harper family turns out to be the greatest blessing—particularly the handsome Aaron Harper, who keeps the farm running in her brother’s absence. But Janie knows his help is only temporary. Is a marriage of convenience to Aaron Harper the answer to both of their problems? And is Kansas far enough away from Boston that she is safe from the baby’s vengeful father? Or will he come after her and expose the secret she’s worked so hard to conceal? . 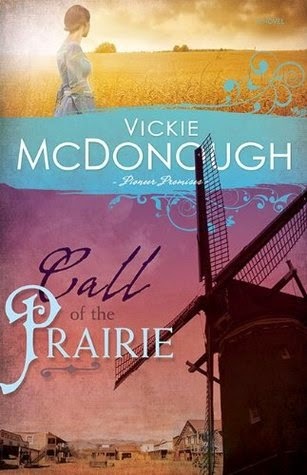 SONG OF THE PRAIRIE is the third and final book in Ms. McDonough’s series, Prairie Promises. 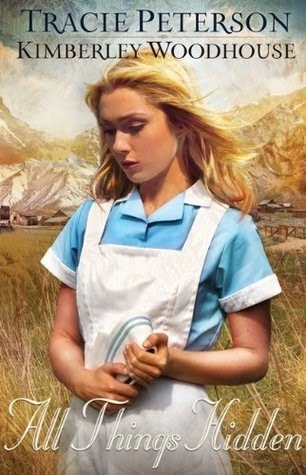 Fans will want to read Whispers on the Prairie and Call of the Prairie first. The stories are stand alone, but the brothers’ stories tie into the other, so you’ll want to read them in order. As I've said in the reviews of the previous two books, Ms. McDonough is a formula writer. But she did shake SONG OF THE PRAIRIE up, with not one, but two deaths in the beginning. I couldn't help but feel sorry for Janie as her world is torn to shreds time and again. Also for Aaron as he's still healing from the loss of his wife (in Whispers on the Prairie"s prologue). 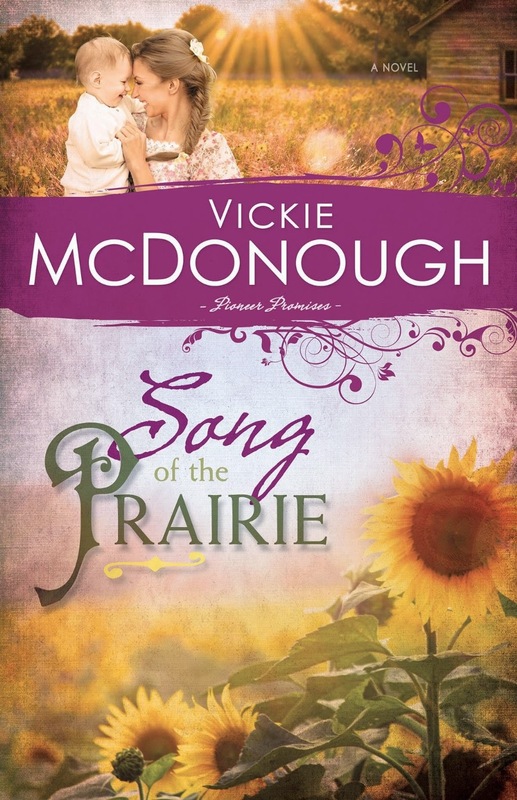 Fans of historicals, of Ms. McDonough’s books, or prairie romance stories will love SONG OF THE PRAIRIE. $9.39 Kindle. $12.99 paperback. 256 pages. My husband has been enamored with the devotional Streams In The Desert ever since he came to saving faith. So when I received a copy of the NIV Streams In The Desert Devotional Bible – he couldn't wait to snag it. With permission, of course. Zondervan does the usual great job with the NIV text, including textual aids and some cross references at the bottom of the page. However, this is a devotional Bible, not a true study Bible, so don’t look for a lot of that material. It’s strength lies in the devotions that are tied to various portions of scripture; 365 of them, to be exact; one for each day of the year. Drawn from Streams In The Desert, as well as from other authors, the devotions help the reader to “put shoe leather” to the passage under consideration. My husband was preparing the evening message when this arrived, and he found material that fit perfectly with his message in the very first devotional. Very cool! The review copy I received was the hardback copy, with a dust jacket. The dust jacket was designed to suggest that this was a book that had been on the shelves for many, many years. As such . . . some might not find it so appealing. Also, one of the “features” mentioned on the back cover was a ribbon marker. The copy I received did not have that ribbon marker. But we're not throwing the book back, by any stretch of the imagination. As mentioned, he's already “put this book to good use,” as it was intended. A family-minded medium and a dogged detective team up to solve a kidnapping case that leads them to places as unlikely as their partnership. Juliet Button doesn't even believe in ghosts, but she believes in supporting her makeshift family of misfits. Having spent years as assistant to her uncle, an illusionist, she now has all of the skills and know–how she needs to make an audience believe the impossible. So, she begins a career as a medium by the name of Miss Avila. She wants nothing to do with a detective with the power to destroy the life she's built, but when President Lincoln's youngest son is kidnapped, and the first lady comes to her for help, she can't refuse, even if it means facing Pinkerton agent Carter Forbes, who knows far too much about her already—and possibly falling in love. VANISHING ACT is the second book in this talented duo’s series, Charm and Deceit. The first book is Diamond in the Rough and it was stellar. VANISHING ACT is just as well written, but I had some issues with this story line. I believe that people can summon people from the afterlife (after all, it was done in the Bible) but I do not approve of such, it is evil (and it was so in the Bible as well) and this book had a distinctly evil feel to it, even though it is Christian, there is a faith message, and there is a good/happy resolution. Some people are more in tune to the spirit world than others, so if you are one of those who are, I’d suggest avoiding this book. If you aren’t one of them, then it probably won’t bother you. There is a mystery in VANISHING ACT. President’s Lincoln’s young son, Tad, is kidnapped, and Miss Avila and Carter Forbes most work together to uncover the truth of his disappearance. Will they be able to solve the mystery and catch the kidnapper? It will take both Forbes detective skills and Miss Avila’s ability to deceive to solve this one—and it will put both their lives in danger. 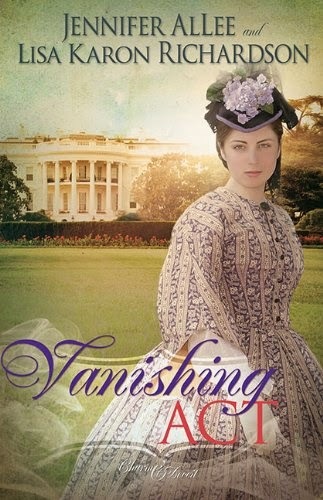 Fans of historicals, either of these two authors’ books, or historical suspense stories will love VANISHING ACT. $9.99 Kindle. $12.99 paperback. 256 pages. giveaway is only open to US citizens. who makes her understand that being a princess takes work. Sanctuary. She resides in Northern, CA. Sophie Davenport feels like a prisoner in her own house. In her twenty–two years, her overprotective parents have taken every possible measure to keep her from anything that might exacerbate her asthma–in other words, just about everything but reading and needlework. Yet Sophie longs for adventure...and for love. She corresponds clandestinely with a would–be suitor, until they meet and her wheezing scares him off. It seems her fragile health just might sentence her to a lifetime of monotonous inactivity. Josh Harper is far more bookish than his brawny brothers. The middle child, he enjoys helping at his family's stagecoach stop in Kansas, where he spends a great deal of time crafting furniture and other items out of wood. But, before long, his book smarts draw him to the nearby city of Windmill, where he begins work as manager of his uncle's bank. He also looks after his niece and nephew, who spend their weeks in town to attend school. The change of scenery is welcome, but Josh yearns for a family of his own. Too bad eligible females are not plenteous on the prairie. When Sophie's aunt, a resident of Windmill, falls ill and requires help, Sophie volunteers. Despite his hesitation, her father finally relents and lets her go, as there is no other option. Her new role brings her into contact with the children boarding at her aunt's home–and with the handsome uncle of two of them. Is there a larger purpose in her coming to Windmill? Or will Josh Harper reject her, if not for her frail health, then for the rocky nature of their relationship? As I said in yesterday's review of Whispers on the Prairie, Ms. McDonough is very much a formula writer. In, CALL OF THE PRAIRIE, the second book of the Prairie Promises series, the mandatory death is still there, but it is the death of a dream. Sophie dreams of a normal life, of being a wife and mother, and she resents her loving parents for being a little too-concerned about her ill health. Josh is the bookish middle brother in his family and, like Sophie, wants to marry. But his problem is not ill health. It's a lack of females. Sarah Marshall just wants to go home. It wasn't her idea to leave Chicago and head west in search of gold, but her uncle's ambition left her no choice. Neither was her intention to settle in Kansas City with her ailing aunt, but being penniless and without possessions brings little bargaining power. Pretty soon, she resigns herself to her fate, however unfortunate. It isn't as if she has a home to go back to. Ethan Harper, the youngest of three brothers, enjoys a peaceful existence helping run his family's stage shop along the Santa Fe Trail. Only one cloud continues to darken his horizon--guilt over the tragic death of his oldest brother's wife. The only acceptable penance Ethan can think of is finding another woman to marry his brother and help raise his motherless children. When a series of misfortunes strands Sarah Marshall and her aunt at the Harpers' Stage Stop, the status quo is overthrown as the presence of an attractive young woman, however unversed in the ways of prairie living, wreaks havoc on the lives of the Harper brothers, all three of them vying for her attention. But will any of them prove himself worth giving up the life Sarah always dreamed of? 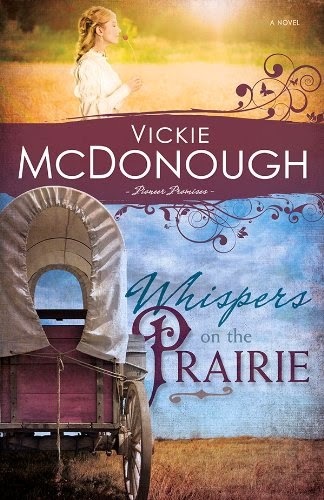 WHISPERS OF THE PRAIRIE is Ms. McDonough’s newest and first series (Prairie Promises) with Whitaker House. Ms. McDonough follows the standard historical blueprint. The book starts with the mandatory death, and even though the hero is clearly not at fault he is eaten alive by guilt and has to make restitution by finding his brother a new wife. Sarah and her aunt are dear characters, both stronger than they think they are and they are able to discover that as the story progresses. The story is interesting though a bit predictable. Fans of Ms. McDonough’s previous books and historical fiction should give WHISPERS OF THE PRAIRIE a try. Recommended. $9.39 Kindle. $12.99 paperback. 272 pages. 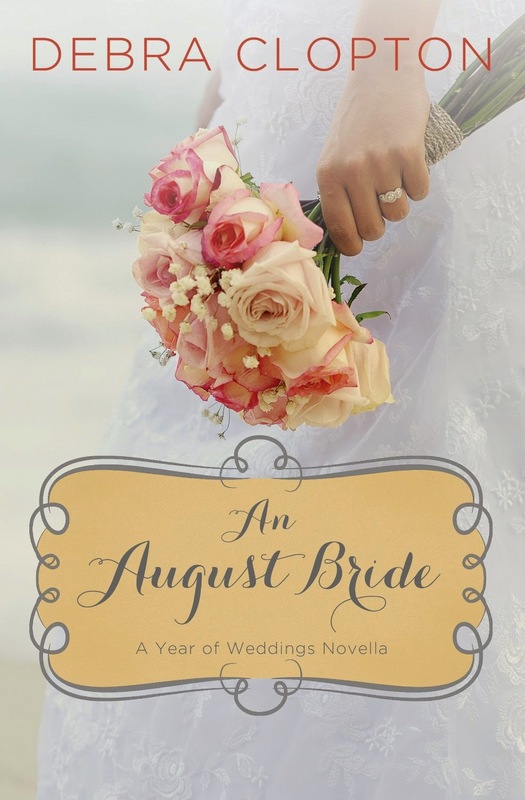 AN AUGUST BRIDE is one of the Year of Wedding books I was so looking forward to reading. One of my favorite cowboy romance writers, Debra Clopton won my heart with her first book and the heroine riding into town and knocking the whole place off kilter. Her romances always have that special touch, and I couldn't wait to read AN AUGUST BRIDE. Brent fell in love with the mermaid immediately upon rescuing her and he won over the heart of the posse and the dog in the same swoop. The only one who needs convincing is Kelsey--but she won't have anything to do with him. He's a cowboy. She hates cowboys. The end. Except, it's not. Brent doesn't give up so easily. But will Kelsey ever learn to trust a cowboy? She didn't expect to fall in love--but roses aren't the only thing blooming on Galveston Island. Cassia Pappas has found herself in a nearly impossible situation. She wants to spend her time immersed in her new job at a Galveston Island floral shop, arranging blooms and brightening occasions with her lovely creations. But her huge Greek family--especially her father--has other ideas. They've all relocated to Galveston to open up a new family restaurant location on the Strand--directly across the street from the Rossis' popular pizza place--and they want Cassia's full participation. To make matters worse, as Cassia is trying to develop a strong professional relationship with Galveston's premier wedding coordinator, Bella Neeley, her own father is intent on stealing all of the Rossi family's faithful customers. Not exactly the best way to get into Bella's good graces! A BOUQUET OF LOVE is the fourth book in the Weddings by Design series by Ms. Thompson. While this book stands alone, fans will want to read the first three books in the series, Picture Perfect, The Icing on the Cake, and The Dream Dress as previous characters do make appearances. I've read so many books set in Galveston, Texas recently that I got a little confused about who wrote what, but I quickly figured it out. I enjoy the real life events Ms. Thompson incorporates into the stories, such as the trolley starting up again after the hurricanes destroyed most of the city. It was fun getting to know Cassia, finding her trying to fit in with the rival Rossi family, and yet keep her own father pacified sure added a lot of tension to the story. 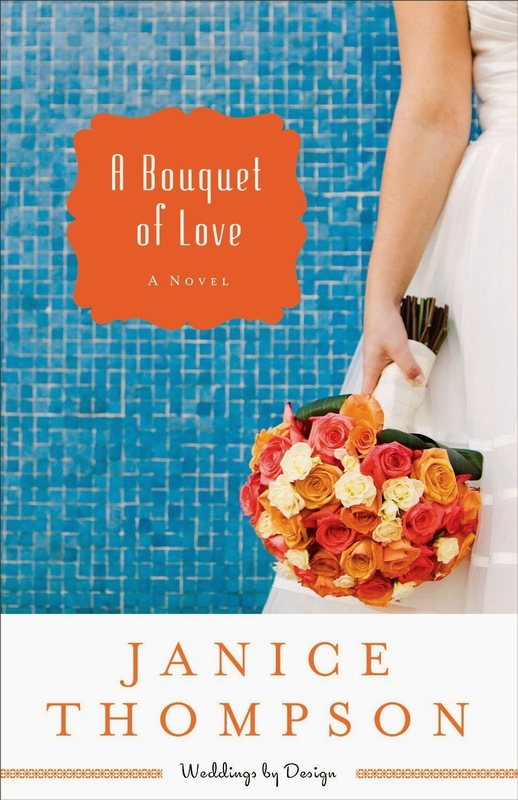 Fans of contemporary romance, romantic comedy, and Ms. Thompson will be sure to love A BOUQUET OF LOVE. I think this is Ms. Thompson's best book yet. 352 pages. $4.99 Kindle. $13.99 paperback. This free short story prequel by bestselling author Mary Ellis provides an early glimpse into the life of Quaker Emily Harrison. Laced with humor and a sweet love story, this bonus material also contains the first chapter of Emily’s continuing journey in The Quaker and the Rebel, Book 1 of the Civil War Heroines series. 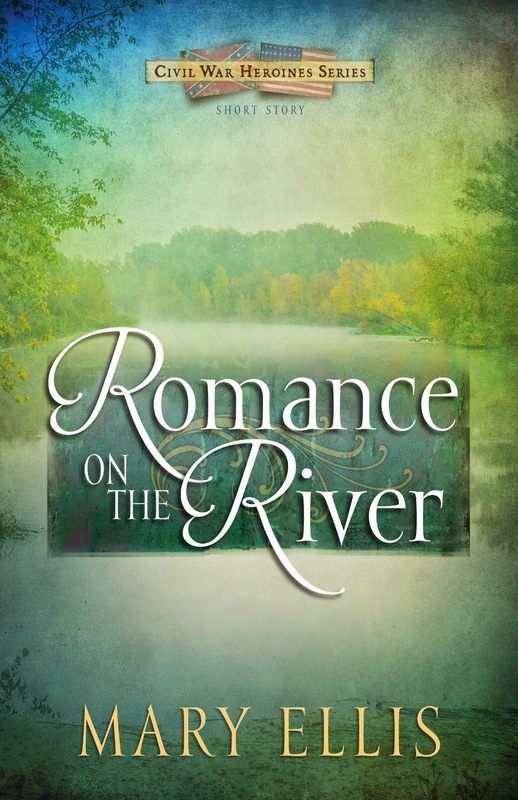 ROMANCE ON THE RIVER is a free e-short beginning to The Quaker and the Rebel by Ms. Ellis. It tells us the backstory of how Emily ended up getting the job working on a farm in the middle of the river. As a story, there is no plot, and no resolution, and it implies that the romance between Emily and Matthew was so much more than it was in The Quaker and the Rebel. Ms. Ellis is a stellar writer, and for free, this is a great prologue to her new series. But don’t read it as a stand-alone. It is only a prologue. A prequel. Or a teaser, introducing the series. JOY WESTFALL, a single woman who runs a tailoring business out of her little home and has a 4-year-old illegitimate daughter knows first hand the bitterness of rejection. Her talent with a needle supersedes her tainted reputation, however, and she has no trouble finding clients. What she lacks is true friendship. Living next door to a little clapboard church on the edge of town, even the folks of the church pay her little mind when they come and go on Sunday mornings--unless she happens to be outside tending her flowerbeds in which case they quickly turn their children's heads away or shake their own at her in utter repulsion. Inside, their hymns of praise compete with the birds, but outside their hypocritical noses turn up at the sight of her. Not until LUCAS JENNINGS, the new preacher, begins to befriend her and her innocent daughter does she grasp what pardon feels like. The trouble is his congregation begins to accuse him of having sinful thoughts, one woman in particular going so far as to campaign to have him removed from the pulpit. When tragedy strikes, Lucas's messages of repentance resonate with his members, drawing an entire community together, changing the hardest hearts, and turning folks' minds toward what really matters in life--love, faith, and forgiveness. THREADS OF JOY is the second book in Ms. MacLaren's Tennessee Dreams series. While it stands alone, readers will want to read Heart of Mercy first, as both main characters in the first book show up as secondary characters in this book. Historically, I had one issue with the book--but it is fiction, and anything goes. This book is set in 1892, a few decades after the Civil War. At that time period, no Southerner would call a Yankee pastor to serve their church. And Lucas was from Michigan. A fact a lot of northerners don't know, the Civil War is still not over. Rebels still hate Yankees even in modern times. I know, it's silly, but it is as it is. Ms. MacLaren has an unique writing style that draws the readers in. A woman judged and found lacking, a preacher out to save the world, and a precocious little girl and you have the makings of a winning novel. Fans of historical fiction and of Ms. MacLaren will want to read THREADS OF JOY. A beautifully stitched together story. $14.99. 336 pages. AT BLUEBONNET LAKE is the first contemporary I've read by Amanda Cabot -- and I loved it. Despite Kate being an apparent workaholic so goes to Rainbow's End with her grandma for vacation. It is a "working" vacation, despite the resort not having wi-fi, but with Greg's help, she makes it work. I fell in love with both Kate and Greg as well as Grandma. I had preconceived ideas on how the story should play out -- and wasn't at all disappointed. The residents of the nearby town are a great cast of secondary characters. If you like contemporary romance then you won't want to miss AT BLUEBONNET LAKE. The perfect read. It isn't on the shelves now, but IS available for preorder. 384 pages. $14.99 paperback. $9.99 Kindle. MINDING MOLLY is the third book in Ms. Gould's The Courtships of Lanncaster County series. I'm not really sure how I feel about it. Great writing. Molly is strong, opinionated, and bossy, very maternal, her Mamm says, but she gets upset when someone doesn't do exactly what she wants when she wants. Leon is a dear. He is quiet, patient, understanding, and willing to question what he doesn't understand. And there is a lot about Molly to not understand! She dated Philip but he broke up with her because she was pushing the relationship, then her mamm decided Mervin would be the one who she should marry to save the farm--but Molly's best friend Hannah is in love with Mervin, so she has to make Mervin fall in love with her friend so she can be free to marry Leon, except Leon is going back to Montana so she has to make Leon want to stay in Lancaster County... And Hannah doesn't seem like much of a friend. I'm not sure what William Shakespeare story this one is allegedly based on, I'm not a huge Shakespeare reader. Not enough to know this without being told. The story is well written. The drama is head-ache inducing. Leon is a doll. I'm going with 4 stars. If you like Leslie Gould and Amish fiction you will probably love MINDING MOLLY. Don't miss this, or the first two in the series, Courting Cate and Adoring Addie. $14.99. 353 pages. What Happens When an Underground Railroad Conductor Falls in Love with a Man Loyal to the Confederacy? Emily Harrison's life has turned upside down. At the beginning of the Civil War, she bravely attempts to continue her parents' work in the Underground Railroad until their Ohio farm is sold in foreclosure. Now alone and without a home, she accepts a position as a governess with a doctor's family in slave-holding Virginia. Though it's dangerous, she decides to continue her rescue efforts from there. Alexander Hunt, the doctor's handsome nephew, does not deny a growing attraction to his uncle's newest employee. But he cannot take time to pursue Emily, for Alexander isn't what he seems--rich, spoiled, and indolent. He has a secret identity. He is the elusive Gray Wraith, a fearless man who fights the war from the shadows, stealing Union supplies and diverting them to the Southern cause. 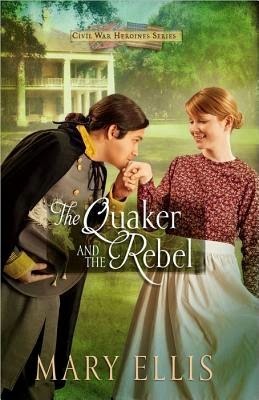 THE QUAKER AND THEE REBEL is Ms. Ellis' first published historical--and the first book in the Civil War Heroines Series. Set during the Civil War, it is a different twist than most Civil War novels featuring main characters on opposite sides of the war. Alexander is the Rebel--and Emily is the Yankee. But... that said, Alexander is also the Quaker and Emily is also the rebel, running a portion of the Underground Railroad. Fans of Ms. Ellis' Amish romances and historical romance fans alike will applaud this newest series. Discussion questions are included in the back as well as a preview to the second book in the series, The Lady and the Officer (which is in my to-be read pile) $9.39 Kindle. $13.99 paperback. 353 pages. 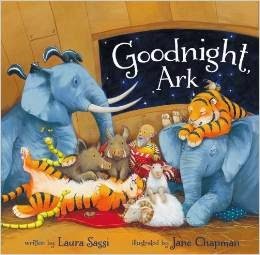 GOODNIGHT, ARK is an adorable children’s book for 4 – 8 year olds. My daughter loved it and wanted me to read it to her (even though she can read it alone) for snuggle time. Biblically, the story is not accurate. I’m sure Noah didn’t let the animals call into bed with him as the skies opened. I’m not sure if animals had free-range on the ark or not, I wasn’t there, but that doesn’t seem quite right. The illustrations are beautifully done, and other than being inaccurate about the story, I have no qualms with the writing. It was cute. For biblical inaccuracy, I’m not giving it five stars, but four for a good bedtime story. 32 pages. $15.99 hardcover. $9.99 Kindle. About the book: Two hearts are about to learn the rhythm of love. My thoughts: I was waiting to read Kay's story. It was shockingly sad to learn her history, and my heart broke for her. I could understand why she acted the way she did. Coop has been a favorite secondary character, and he had some surprising thoughts and dreams. I hoped he'd find his true calling -- and admired him from pushing beyond his "dislike" of Kay to getting to know her as a person. IN PERFECT TIME was a bit slow starting, and I wasn't sure I'd like it. But by the time I reached the 1/4 part of the book I was hooked and had to keep reading. Fans of Ms. Sundin's books, WWII stories, or historical fiction will love IN PERFECT TIME. Don't miss this book. About the author: Sarah Sundin is the author of With Every Letter and the Wings of Glory series. In 2011, A Memory Between Us was a finalist in the Inspirational Reader's Choice Awards, and Sarah received the Writer of the Year Award at the Mount Hermon Christian Writers Conference. A graduate of UC San Francisco School of Pharmacy, she works on call as a hospital pharmacist. During WWII, her grandfather served as a pharmacist's mate (medic) in the Navy and her great-uncle flew with the US Eighth Air Force in England. Sarah lives in California with her husband and three children.